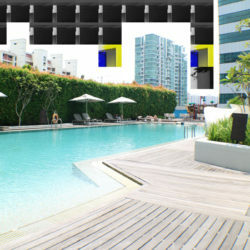 The Trans Resort is making quite a name for itself in uptown Seminyak. 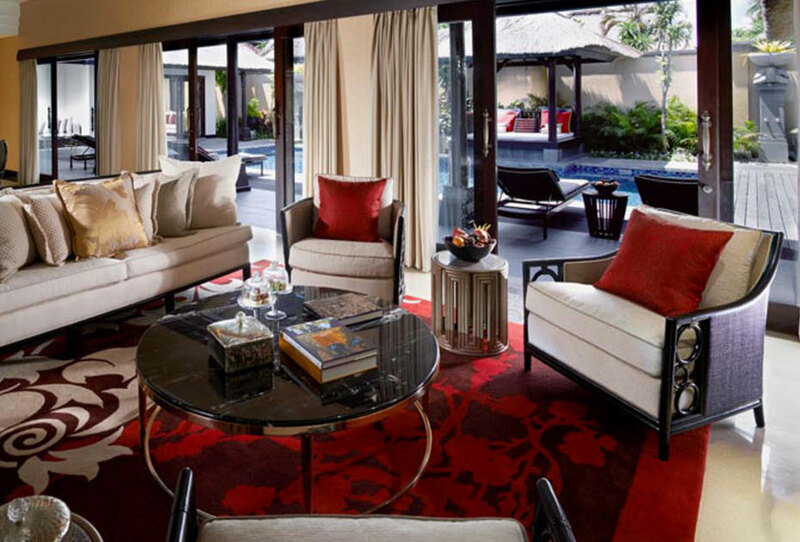 This exceptionally appointed resort is fit for a traveller who wants to indulge in a little Balinese elegance. 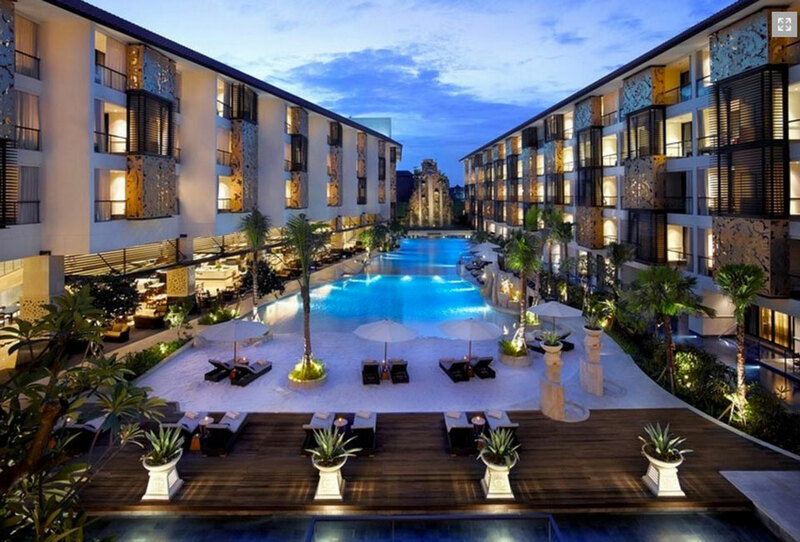 I stayed at The Trans Resort Bali (click here), in August 2015 only a few months after its official opening. 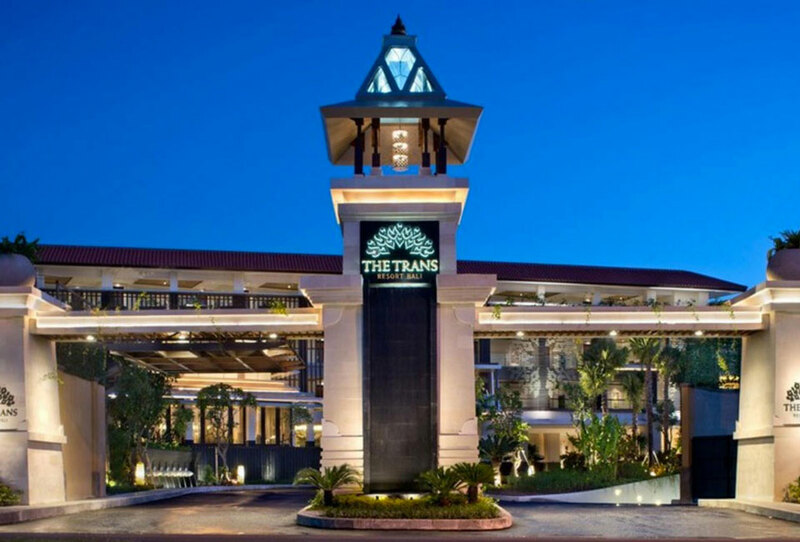 The Trans is ‘the little brother’ of the 6 star Trans Badung another hotel branch under the CTCORP conglomerate. The Trans Resort Bali is located towards the end of Sunset Road which is only a short 5-10 minute walk to the heart of Semiyak. The Trans is extremely secure and on arrival each car is stopped and inspected at the restored Balinese temple gate from the resorts security. “Don’t worry it’s normal with big western resorts” the cabby proclaimed. Boasting 200 rooms, 16 private villas, an enormous pool, a massive gym (with separate male and female sauna, spa, lap pool), beautiful spa villa, restaurant, rooftop bar, grand ballroom, shops and the list goes on and on. As we jumped out of the cab we were ushered to the check in desk. To say this is a large welcoming area is an understatement. It is rich in traditional Balinese architecture and has lavish features. As we were waiting for check in, I took in our surroundings from the relaxing lounge area. 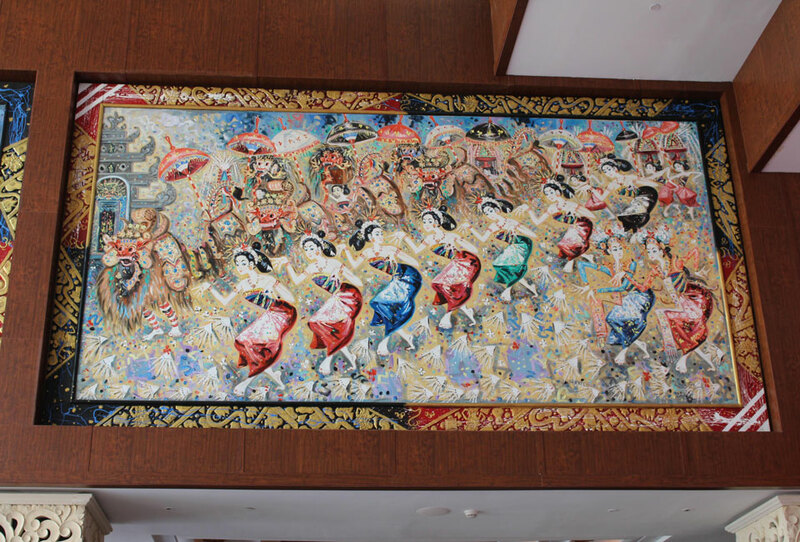 The floors are Italian marble while the walls of deep red velvet with golden flowers are built in to the stone façade and two of the largest ever hand painted original artworks from the Legendary Balinese artist Nyoman Gunarsa are positioned high above in the atrium. These vibrant colourful paintings really energise the whole room. Our Premier Club room was extravagant and very spacious. 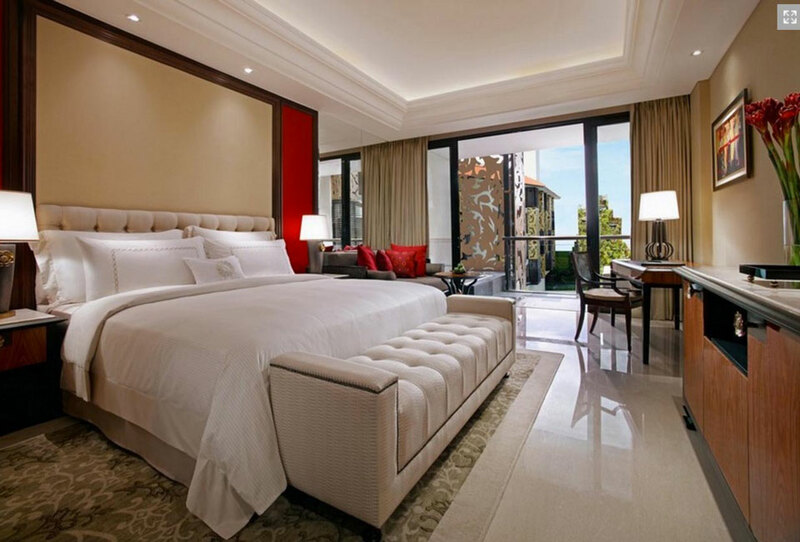 The room has a cream tone throughout with lashings of deep red velvet that give a ‘regal feel’ to the room. The king size bed was extremely comfortable and as we were on the 3rd floor we had a great view of the pool area from our balcony which had it’s own Jacuzzi. The Jacuzzi was great to relax in the evenings when the temperature wasn’t so hot. The bathroom was floor to ceiling marble with separate jet bath and shower with Acqua di Parma amenities everywhere. We had a brisk two-minute walk from our room to the villas. Each villa has a separate decorative stone and wooden temple gate to enter through. The Presidential Villa is quite possibly one of the most beautiful villas in a hotel/resort I have stayed in. It was huge and bathed in natural sunlight!! The sanctuary compromised of three very large king sized bedrooms, all with their own private en-suites with separate Jacuzzi, showers & outdoor shower. Each room was slightly different and was full of brilliant Balinese earth tones of wood, stone and marble. There was a beautiful boardroom sized table for breakfast with adjoining informal and formal lounge areas. The Villa encompasses a 12×5 metre pool with Bale and is abundant in lush tropical greenery. Each outdoor faucet is a type of animal, be it turtle or frog emphasizing the resorts connection with nature. We ate twice at the restaurant for breakfast & lunch. The restaurant is buffet style in the morning and a la carte for lunch and dinner. The Hainanese Chicken I had for lunch was close to, if not the best iv’e ever had! All dishes are available for room service! And once again the Hainanese Chicken was ordered. 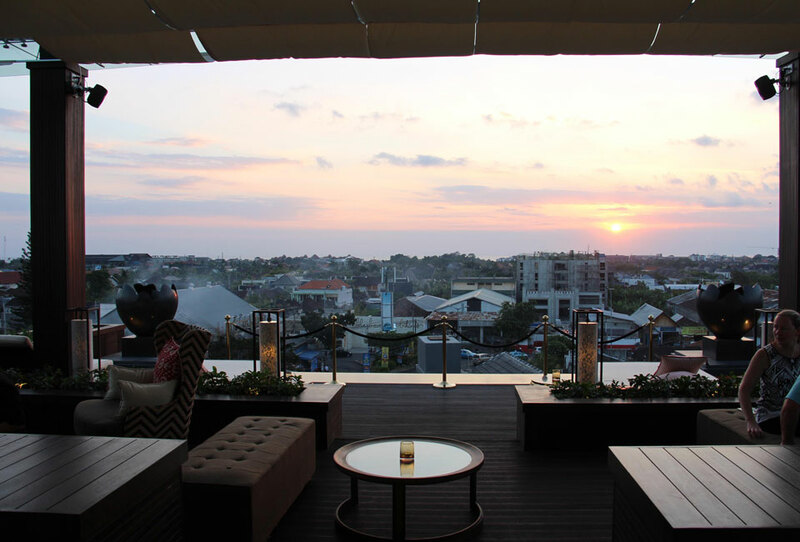 The rooftop bar called The 18th is an extravagant open air bar with picturesque views of the Indian Ocean. The bar is stylish and contemporary with an impressive Indonesian touch of glitz and glam. There are loads of very popular restaurants near by Barbacoa, Sardine & Da Maria to name a few. Also the hotel provides bus transfers to Potato Head & Woo Bar as well. The resort is made up of two large wings that overlook a gigantic sand* pool. Beach chairs, fountains, a slippery dip and it’s very own waterfall are all in this area. While the private villas each have a private pool and are only a swift golf buggy ride away from the main one. *The Trans Resort Bali’ director Mr Alexander Jovanovic told us that they had specifically flown in sand from the Whitsundays in Australia to give the pool its pure white glow. ‘Revitalise your mind, body and spirit and immerse yourself in refined holistic treatments inspired by Balinese philosophies at the chic Trans Spa’. I visited the Trans Spa when I had a few hours spare during my stay. It was lovely, the staff were so nice and bubbly. I treated myself to a wellness package, which included a hot stone massage, foot massage, and it’s signature Wine Elixir treatment. For me personally I could not fault The Trans Resort Bali in anyway. If had to try and really fault something I would say that the gym workout area is that big it could be utilised a bit better. I was truly delighted to stay at The Trans Resort Bali. The Trans Resort team were an absolute pleasure, always friendly and happy to help book activities or restaurants while adding their local knowledge. They really made my experience in Bali that little bit better! I was completely relaxed for my flight home and if you haven’t already booked The Trans Resort Bali or have a couple nights spare I highly recommend checking them out. Until next time Trans! 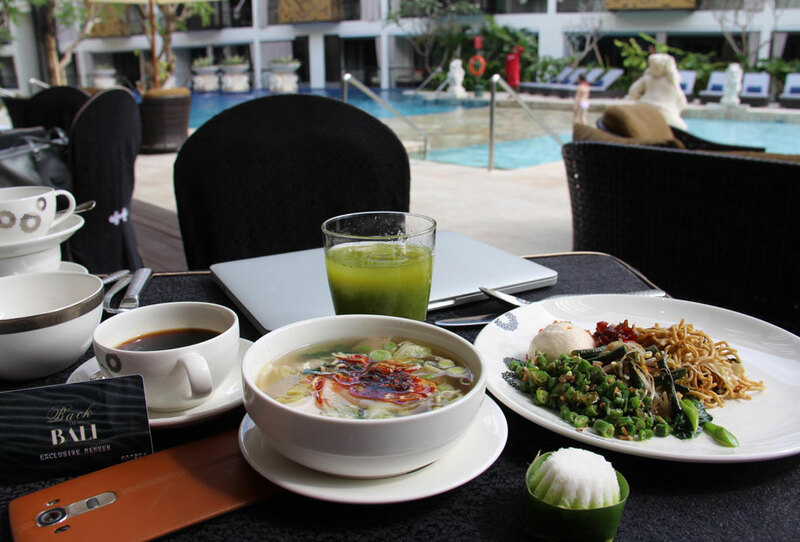 If you would like to see more places to stay in Bali click here. Disclaimer: My stay at the Trans Resort was provided complimentary as a collaboration with Back In Bali. All opinions/thoughts are my own. 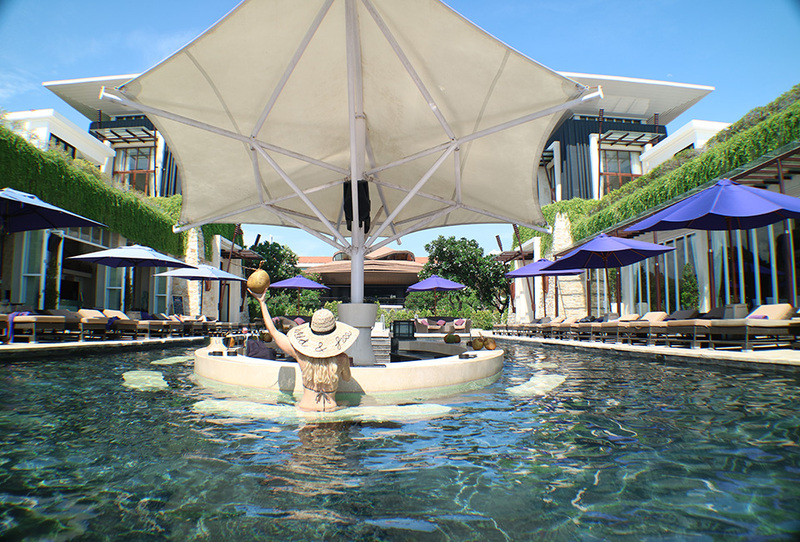 Have you stayed at the Trans Resort Bali before? Did you enjoy it as much as I did? Please leave any questions or comments you might have below.